I’ve written before that I’m worried people chained to underwater mortgages will upset the supply and demand balance in the job market. One of the unique things about the American job landscape is the ability of workers to easily go to where the jobs are. If you can’t find decent work in New Jersey, you can up and move to Washington State (the equivalent distance of moving from England to Syria) if that’s where they’re hiring. Think about it. Do you currently work in the town (or even state) you were born in? What about the town or state your parents were born in? Or your grandparents? American workers are very mobile and flexible workers. [D]epressed sales and sinking home prices in many parts of the country are complicating relocations and transfers for thousands of workers … A survey last year by Worldwide ERC, a nonprofit association that represents relocation specialists, found that depressed home values emerged as the No. 1 reason for resisting job transfers for the first time in more than 10 years. Of the member organizations that reported employee reluctance to move, 71 percent cited the sluggish real estate market as an impediment to a job-related move, up from 16 percent last year. There are probably close to 10 million households currently with zero or negative equity in the U.S. For these homeowners, it will be very difficult to accept a job transfer to a different county or state. 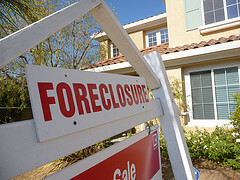 Definition: Negative Equity: a homeowner owes more than their home is worth. To size the problem: According to the Census Bureau, from 2005 to 2006 (the most recent data), approximately 1.7 million owner-occupied households, moved to a different county or state. If approximately 1 in 8 households (the same proportion as with negative equity) will not accept a transfer now because of depressed home values that would be about 200,000 households per year that will be reluctant to accept job transfers. This is clearly a bad thing for the overall job market and economy. The most obvious problem is that companies might not be able to get their hands on the qualified workers they need. But let’s look at this from the worker’s point of view as well. If you’re restricted to your current geographical area, your job choices are limited to say the least. And if, say, you get laid off from the factory in your home town, you have no ability to go to the next factory over because you are a mortgage prisoner. This can also affect the forward trajectory of your career. White collar careers now mean a great deal of travel and moving as you climb the corporate ladder in that multinational corporation. What happens when you’re offered that promotion to regional manager… but it’s in Atlanta? You can’t move to Atlanta because you can’t sell your house! I heard about a client we had recently who was a scientist… a cancer researcher. As the story was relayed to me, the research facility in his hometown of 15 years was closed because the company he worked for was downsizing and reorganizing all research to the east coast. But he figured he couldn’t make the move and hold on to his job because his house was now worth about $90,000 less than what he had paid for it. That came to about one year’s salary. He couldn’t just swallow that sort of loss. This cancer researcher was considering leaving the industry altogether and trying a new career field because he thought he had to stay where he was. Fortunately for him, his employer was a deep-pocketed Fortune 500 company which agreed to pay the difference on his mortgage and sell the house on his behalf. I’m glad, since he was a friggin cancer researcher, that things worked out for him. But I don’t think everyone can be so lucky. That is one good reason for renting! I cn easily move to another location. Problem though still exists in finding another job/position out-of-state. You are fighting against locals who are looking as well and most companies will not relocate you. – even if you are not asking for relocation financing. So the end result is that people are STILL stuck in the same location regardless of their ability to relocate.